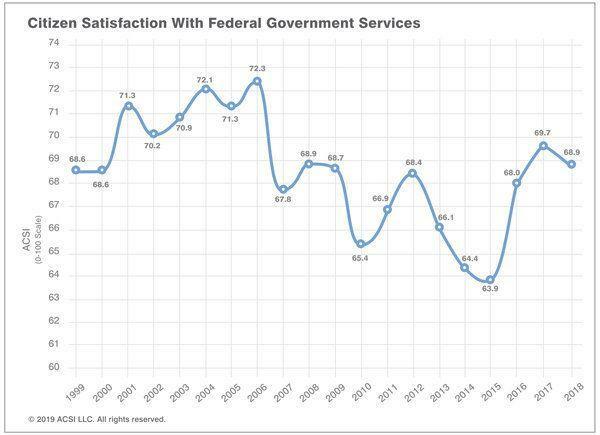 After two years on the upswing, citizen satisfaction with the federal government has faltered, according to a report by the American Customer Satisfaction Index (ACSI). The dip was small: only 1.1%, and satisfaction rates remain strong at 68.9. That’s the second-highest rating since 2008. One giant caveat to note with this report: The data was collected before the government shutdown, and Forrest Morgeson, ACSI’s director of research says this decline “couldn’t have come at a worse time”. “In all likelihood, the shutdown will exacerbate Americans’ declining satisfaction with the federal government in 2019,” he said. While it’s not known how much a hit satisfaction will take because of the shutdown, Morgeson says that dips in satisfaction will likely hit some departments harder than others, like the Department of the Interior which oversees national parks. The Department of Homeland Security could also feel the impact — the TSA was hard hit by the 35-day long shutdown. 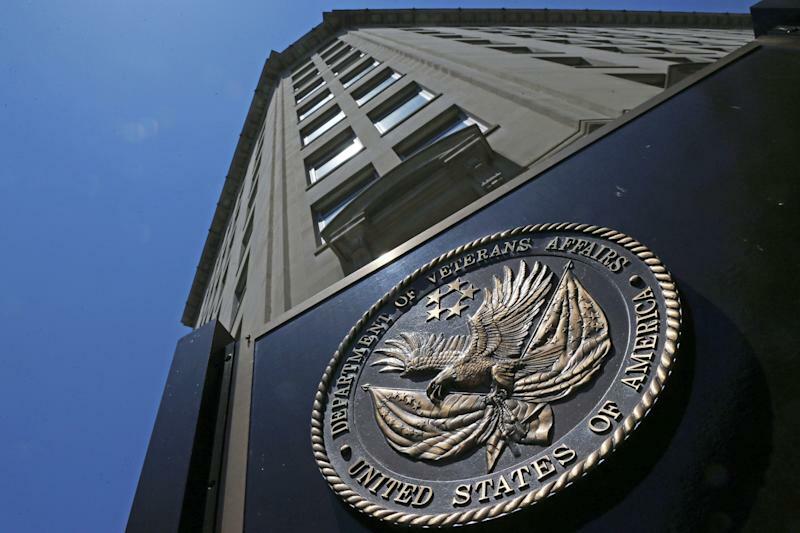 According to the annual report, at the time of the survey, both the Departments of Defense and the Interior held the highest customer satisfaction scores at 78. The Department of Commerce scored 74 points, just ahead of the Justice and State Departments, at 73. These rankings are comparable to many private-sector services. The highest satisfaction recorded since 2007 was in 2017 at 69.7. Last year’s score is a tie with that in 2008. The lowest was in 2015 at 63.9. 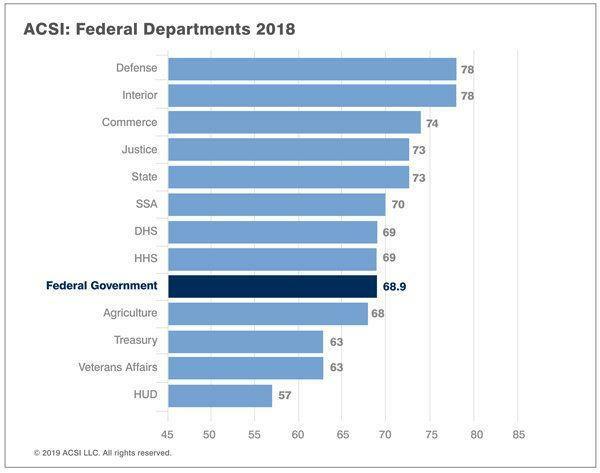 At the time, Morgeson says, the very low satisfaction with federal services was attributed to reductions in both federal spending and federal employment levels. “It proceeded to jump substantially the next two years,” he says. “In fact, other than a handful of very dissatisfying telecommunications companies (cable TV and Internet Service Providers), the federal government scores at the very bottom,” he said. In 2018, Comcast (CMCSA) and Frontier Communications (FTR) scored lower, at 57 and 56 points, respectively. ACSI says it doesn’t record satisfaction levels along party lines — although it does collect data about political affiliation. 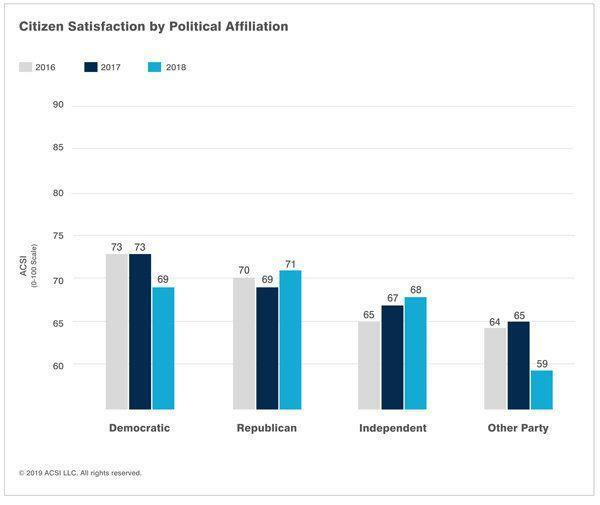 According to the report, Democrats and Republicans felt similar levels of satisfaction in 2016 and 2017 as the federal government transitioned between the Obama and Trump administrations. But those levels changed in 2018. Satisfaction levels among Democrats fell more than they rose among Republicans, according to the survey results.